We targeted incoming students as the primary user of viewing the website. In terms of updating and modifying the website using the WordPress content management system we focused on faculty and staff. Creating a custom WordPress theme for the different departments across the College of Engineering to use in order to provide an accessible, consistent and branded experience for students, faculty and staff. 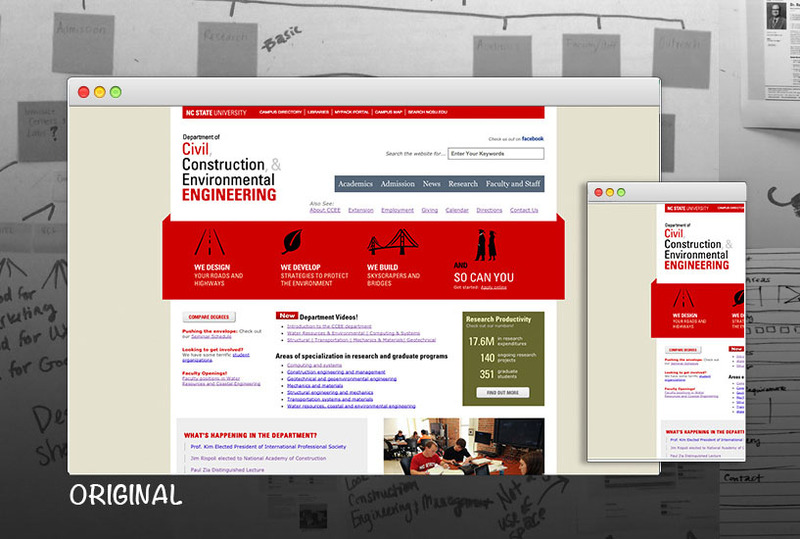 The Department of Civil, Construction & Environmental website before redesign. 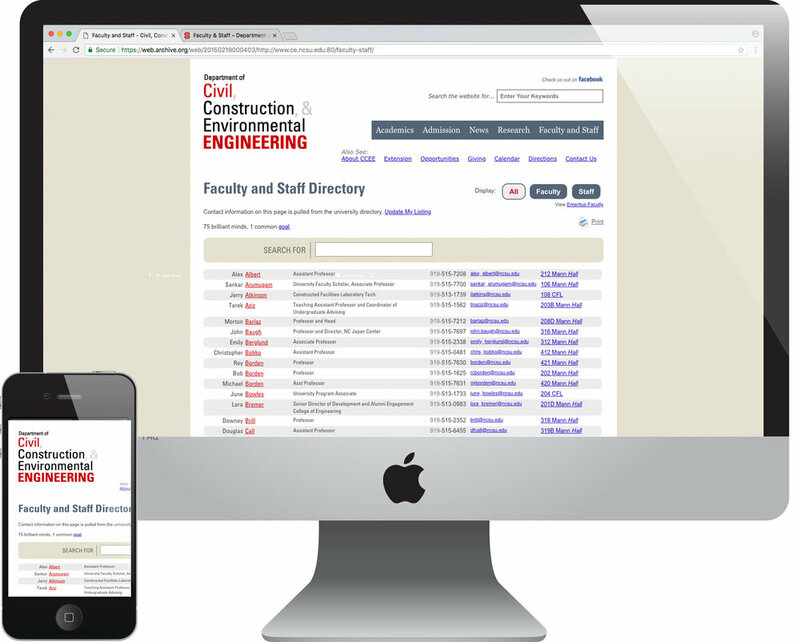 Allow Faculty and Staff to make changes to their website without the overhead of requesting changes through our web team. Previous Faculty and Staff page. 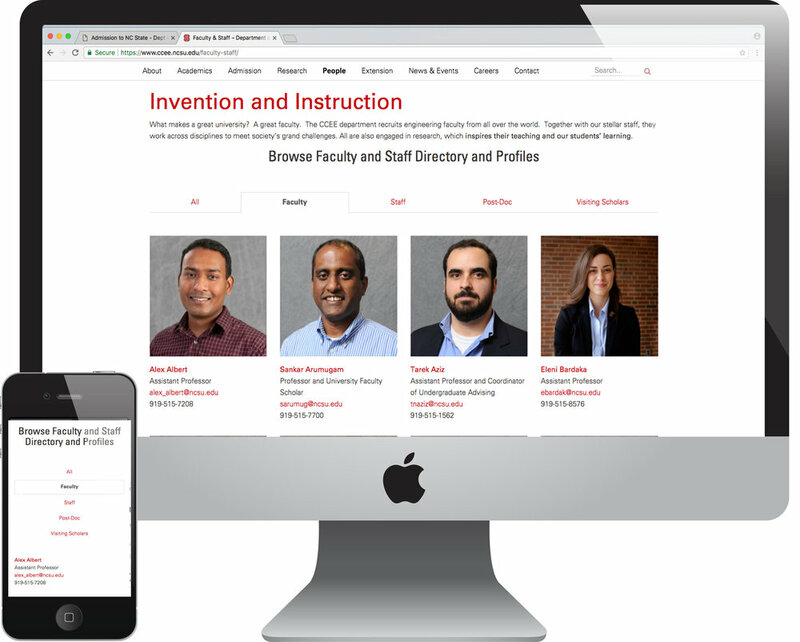 Updated concepts for Faculty and Staff page. We began with an extensive content audit and stakeholder interviews to determine common needs across all departments. Then we moved onto sketches and concept iterations, including variations on mobile platforms and different screen sizes. These concepts informed our style definitions across the entire site, including typography, spacing, image modules, icon usage and navigation. Finally we migrated the old content into the new site, testing for accessibility and to ensure that the content fit our new styles and templates. The web team migrated the the original content from the Department of Civil, Construction and Environmental Engineering in early 2016. Since then nearly all departments within the College of Engineering has moved their content into the Wordpress environment under this theme and each department continues to maintain and grow their site to this day. These websites represent a responsive, branded and accessible alternative to their previous websites - and continue to serve as the primary interface for incoming students, professors and researchers.